One day soon, swarms of unmanned craft could be performing everything from battlefield missions to search-and-rescue operations. 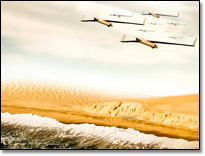 Boeing is testing swarm technology that enables disparate unmanned vehicles to work together as an intelligent group. Employees in programs that may be winding down can take lessons learned from those who worked in the company’s Space Exploration and found new opportunities within Boeing when the shuttle program came to an end.